The Humboldt Park branch was built in 1895 by the Metropolitan West Side Elevated Railroad Company, Chicago's third elevated company and the first to use electric traction. Among the Met's three branches was the Northwest branch, which itself split again just north of Robey (Damen) station, with the Logan Square branch continuing northwest along Milwaukee to Kedzie and Logan Boulevard and the Humboldt park branch turning west along North Avenue. Ultimately, the Humboldt park was planned to reach 72nd (Harlem) avenue, a distance of 6.5 miles. Service between Canal Street on the Metropolitan main line and Robey Street on the Northwest branch was inaugurated on May 6, 1895. The Humboldt Park branch opened to a temporary terminal at the intermediate point of Lawndale Avenue, far from the intended goal of 72nd (Harlem) Avenue, on July 29. In point of fact, however, the Harlem destination was never reached and the out-of-the-way Lawndale terminal remained in use for the rest of the branch's existence. As opened in 1895, the Humboldt Park branch had five stations: Western, California, Kedzie, Ballou (later changed to St. Louis), and Lawndale. All of the stations except Lawndale had dual side platforms, with canopies and railings typical of all Met stations: Designed into the railings were larger cast iron square plates with a stylized diamond design. Each platform had a short canopy in the center of the platform, covering the stairs and a small waiting area. The canopy frame was iron, with latticed supports and bracketed rafters. The long canopies had hipped roofs of corrugated metal. Lawndale terminal had a single platform served by just one track. The station houses were also typical of general Met designs, using the same design as the Northwest/Logan Square branch stations -- the exteriors were constructed of brick and terra cotta, featuring a bay outcropping in front. The exception was the Humboldt Park Blvd. station, added later, which used a unique design more akin to later Douglas Park branch stations. Lawndale terminal was really only a terminal in name only. Its physical layout and design gave little indication that trains were meant to turnaround and be stabled there, as it had only one track serving one platform and no real yard to speak of. Two additional tracks were provided at Lawndale for storage of a few cars, and additional storage space later had to be "created" by storing cars between Western and California stations off-peak on one of the two main line tracks, requiring the branch to operate as a single-track during these times. 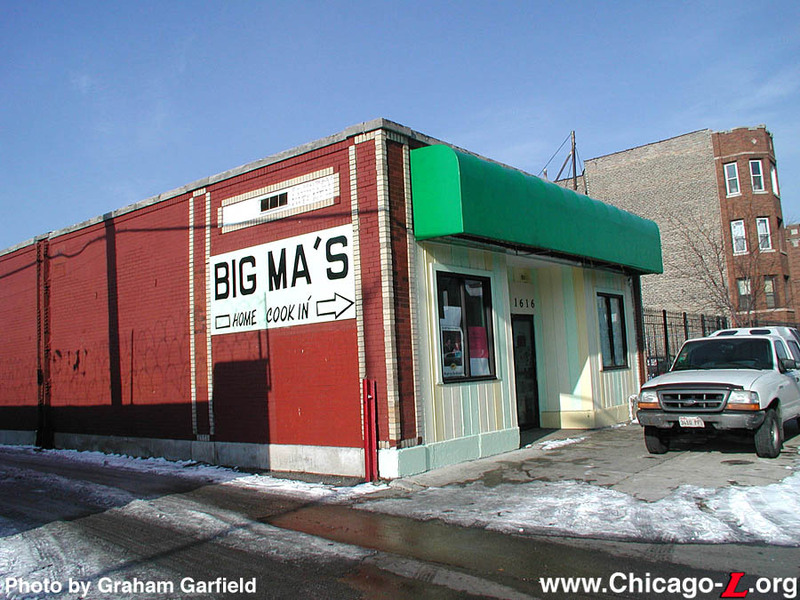 Lacking an inspection and maintenance shop, routine inspections were handled outdoors, with larger overhaul jobs handled at Logan Square Shops or another Met facility. This condition was only meant to be temporary, as the line was originally intended to be extended west to the city limits at 72nd Avenue, where a more substantial terminal and yard surely would have been built. However, in 1895 the area west of the Milwaukee Road tracks (located just beyond the Lawndale terminal) was not particularly well developed. Additionally, the Met would face direct competition from the Milwaukee Road's own local stations if they went west of Lawndale, as well as from the North Avenue streetcars, both of which would skim off what little long haul traffic there was. So for the time being, the Met decided against constructing the expensive crossing over the Milwaukee Road, saving that cost for a time when the traffic would justify it. From the beginning of operations, all Metropolitan trains terminated downtown at the Franklin Avenue terminal at all times, with the exception of the lightly-used Humboldt Park branch. Humboldt trains only ran downtown during rush hours. During owl service, only a single car shuttle operated and connected to Logan Square trains to downtown at Robey station. At all other times, Humboldt motor cars actually pushed their trailers to Robey, where they would be coupled onto the rear of Logan Square trains for the trip downtown. On the return trip, the trailers would be uncoupled at Robey and a Humboldt motor car would hook up to them for their trip to Lawndale. This awkward procedure continued until the Met converted its cars to multiple unit control in 1904-05. 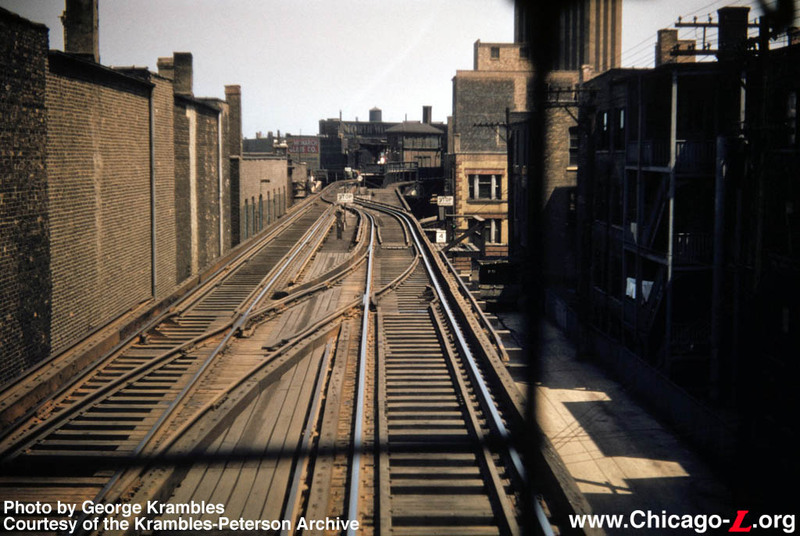 Thereafter, trains were combined and cut at Robey (same as before, just without that awkward "pushing" procedure) well into the CTA days, until 1950. Few changes were made to the Humboldt Park branch after it opened. On November 11, 1902, a new Humboldt Park Blvd. station opened. Residents along the boulevard had demanded the station because they felt that the neighboring stations -- just a few blocks away in each direction at California and Kedzie -- were too far away. In the years soon after the turn of the century, the Metropolitan was actively forming and executing extension plans for several of its branches and the Humboldt Park was no exception. On March 30, 1906, the city council approved the Met's proposal to extend the branch westward to Harlem (72nd) Avenue, with elevated construction to 52nd Avenue and ground-level operation beyond. It also allowed for the connection of other electric railways and interurbans to the branch, for access to the Met's downtown Fifth Avenue Terminal. One potential user would have been the projected Chicago Desplaines & Fox River Railroad, an interurban proposed to link Chicago with Lake and McHenry counties. Construction of the extension never took place -- if it had, it is likely the branch might have prospered and survived beyond the 1950s -- but real estate promoters continued to mention the extension plans for some time afterwards. By the 1930s, the privately-owned Chicago Rapid Transit Company system -- which the Metropolitan Elevated and its branches had all been incorporated into -- slipped into decline as the Depression took effect. Still, convinced that the decline was only temporary, the CRT continued to make improvements. By the end of 1930, all station platforms on the four Metropolitan Division branches, including the Humboldt Park, and the main line were extended so that they could handle 8-car trains. Operations were for a Humboldt car to couple to one or two Logan Square cars at Damen for the trip downtown and back, with weekday rush service provided by running alternate Logan Square and Humboldt trains. 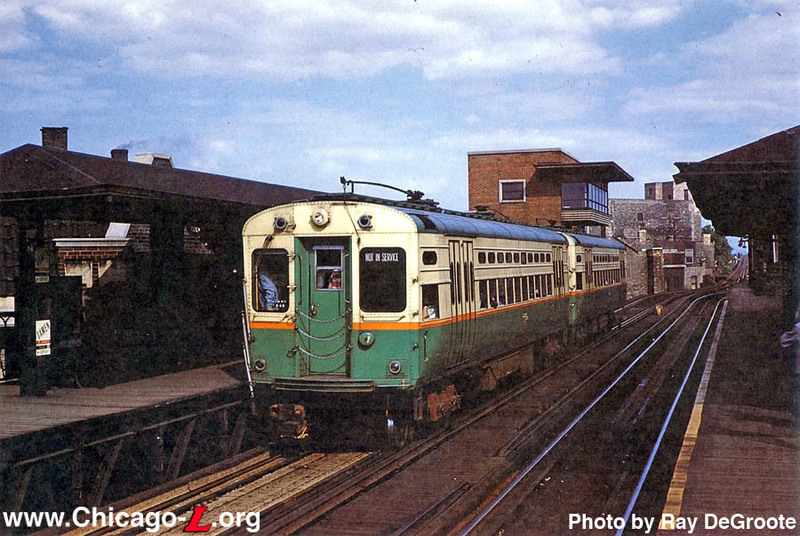 These rush hour trains were the first recorded instance of what became skip-stop express service, with Logan Square and Humboldt trains alternating stops between Damen and Marshfield starting sometime in the 1930s. In 1947, the Chicago Transit Authority took over the assets of the Chicago Rapid Transit Company and assumed operation of the "L" . When the CTA took over, they set out changing one of the CRT's biggest downfalls: they had failed to adapt to changing land use and ridership. No lines were ever abandoned by the CRT and few stations were ever closed. The CTA quickly changed all that. They studied each rapid transit line and monitored each station. Then, bit by bit, they closed the stations and lines that were most uneconomical and had the lowest ridership to concentrate on the stronger routes. This became the CTA's overall policy driving route reorganization for their first decade or so. The Humboldt Park's main problem was its out-of-the-way terminal at Lawndale, a location with no significant ridership generator. Had the branch been extended as planned, at least to the commercial corridors at Pulaski and Kostner less than a mile west, its ridership and prominence may have been able to reach higher levels. The notion that the Humboldt never extended west of here due to difficultly crossing the Milwaukee Road is unlikely, as the Lawndale station is said to have been at a higher elevation than the typical station, suggesting that the Met had made the provision for a crossing over the elevated Milwaukee Road tracks and to extend the line further west, if so desired. More likely, by the time the population density west of Lawndale had reached a level to possibly justify the extension, the project would have entailed a significant amount of land acquisition and clearance, an expensive endeavor that neither the Met nor its CRT successor was in a position to undertake given the modest returns that probably would have been gained. Another fundamental problem with the Humboldt was that it was just a half block north of the busy streetcar line on North Avenue, and the "L" line was not terribly competitive with the carline from a frequency of service standpoint. Still, in spite of these shortcomings, the branch did not have insignificant ridership. Certainly, its patronage paled when compared to the system's main line services on the North and South Sides. But compared to other doomed branches the CTA would close like the Normal Park and Stock Yards lines, the Humboldt Park branch had a healthier ridership level, thanks to its serving the business district along North Avenue and nearby residential areas in the northern Humboldt Park neighborhood. As such, the CTA could not abandon the route outright. Rather, it was subjected to a series of service reductions that slowly discouraged usage of the line and diverted existing passengers to other services. The CTA had targeted the line for abandonment as early as 1949, but local political pressure forced its retention for a while. In 1948, it was decided that the practice of adding and cutting Humboldt cars from Logan Square trains at Damen was causing delays and other problems, especially with outbound passengers ending up in the wrong part of the train. So on August 29, 1948, off-peak Humboldt Park service was cut to a Lawndale-Damen shuttle. The Humboldt car would arrive just before a Loop-bound Logan Square train, discharge at the inbound Damen platform and pick up Humboldt Park-bound passengers, and cross over to the northbound track just north of the station to return to the branch. (During rush hours, the practice of Humboldt Park trains running directly downtown remained unchanged, although now all Logan trains would serve the Loop and all Humboldt trains would terminate at the Wells Street Terminal.) This move was presumably controlled by Damen Tower, as it occurred at the interlocked right-hand crossover immediately south of the junction. This service change, in and of itself, was not altogether different from the type of service revision the CTA would enact on the Evanston Line the next year. The early 1950s, however, brought more severe and more direct service changes that would lead directly to the closure of the branch. On February 19, 1950, the CTA began the first actual reduction in service levels by eliminating late evening and owl service on the branch. The next change was actually only indirectly to the Humboldt, but still had a significant effect. In December, the Logan Square service was entirely re-equipped with brand-new, all-steel 6000-series cars. Humboldt service, however, was deemed unworthy of the new PCC equipment and remained outfitted with old wooden cars. Not only did the two types have vastly different operating characteristics, but passengers took notice of the new cars. Logan Square riding went up, while Humboldt Park ridership went down. Somebody who had a choice of riding a bus or walking to one or the other now preferred to go to Logan. While the opening of the Milwaukee-Dearborn Subway on February 25, 1951 didn't result in the closure of the Humboldt Park branch, it did put one of the final nails in its coffin. The subway provided more direct service to downtown from the Northwest Side and as such all Logan Square trains were rerouted via the subway effective that date. At the same time, the old Paulina elevated portion of the Northwest branch route to downtown via Marshfield Junction -- which later became known as the Paulina Connector -- was closed for revenue service. City ordinance prevents the use of wooden cars in the subway, so without the Paulina elevated the Humboldt Park service was now stranded from downtown. 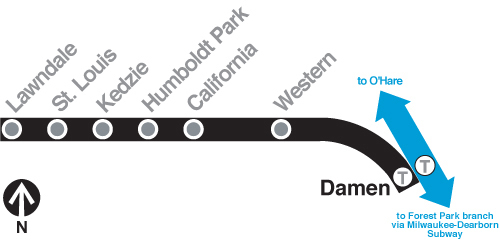 Effective on the same date the subway opened, Humboldt service to the Wells Terminal was abandoned and reduced to a Lawndale-Damen shuttle at all times. Humboldt trains also no longer discharged directly onto the inbound platform at Damen for a direct, same-platform transfer. A new platform was built on the branch itself, just west of the junction with the Logan Square branch. A long track-level walkway led from the shuttle platform, along the tracks, through the Damen Tower, and onto the north end of the inbound Damen platform. Thus, the Humboldt shuttle cars never conflicted with the through-routed Logan Square cars. Operationally, the track configuration at Damen Junction and on the branch immediately west of the junction was changed to create a single-track stub-end terminal (at least in practice -- the track still continued past the platform to connect to the mainline at the junction) that did not require a towerman or any attending of the switches for the shuttle cars to reverse direction. Immediately east of the right-hand crossover that already existed at Hoyne Avenue, the eastbound track was removed east to the junction and a switch installed that merged the eastbound track into the westbound track. The shuttle platform was built on the right-of-way formerly occupied by the eastbound track, immediately west of the junction. The switch connecting the two tracks was a "spring-and-return switch", a type of track switch which does not have to be lined for a trailing move but will spring to the desired route to allow the wheels to trail through its points, and then will return to the original position. This meant that eastbound trains could go through the switch and it would automatically align the switch points for the merging move. Once the wheels passed through the switch, the points automatically sprung back into position for the straight-ahead move, which was for the westbound track, so when the trains changed ends to head back to the Lawndale the switch was already in the proper position. This was a typical arrangement for many terminals on lightly-used branches in the 1950s, such as the Kenwood and Normal Park, as it provided an efficient and economical way to regulate the terminals' train movements. The spring-and-return switch at Hoyne was protected by stop boards ("Stop / Caution") for moves in both directions. 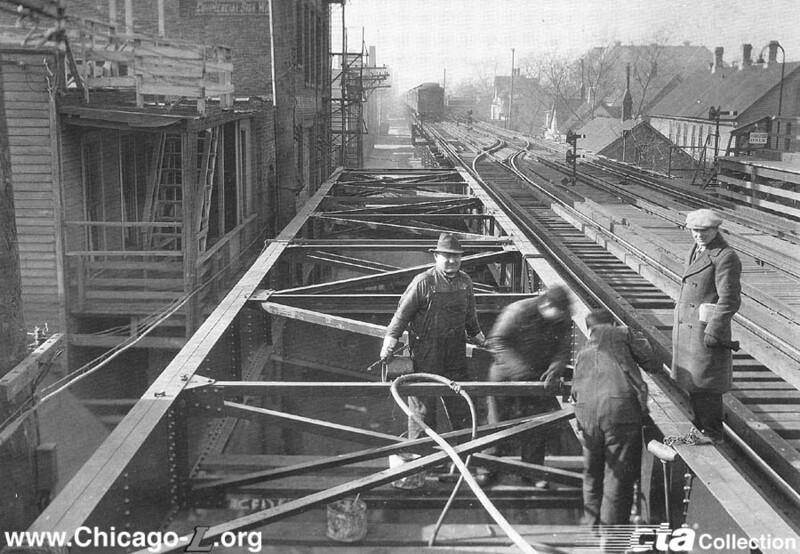 Use of the interlocking at Damen was discontinued except for shop moves of the Humboldt Park cars to and from Logan Square as needed. Several other changes were put into effect on February 25, 1951 as well. All ticket agent coverage on the branch was discontinued. All fares for passengers transferring to or from Logan Square trains were paid to an agent on the platform at Damen. All other riders (those whose origin and destination were both within the confines of the branch) paid their fare to the shuttle car's conductor. The transfer between Logan Square and Humboldt Park trains now proved to be rather inconvenient. An outbound passenger had to go down the stairs from the northbound platform to the mezzanine, back up on the southbound platform, through the tower, and down the nearly block and a half long track-level roofless walkway to the shuttle platform. Considerable backups resulted with the practice of all passengers connecting at Damen having to line up to pay a single agent when a car with 20-30 people arrived, resulting in stragglers missing their connection and outbound passengers having to fight their way through the crowd, also possibly missing their car. However, the branch still had its share of riders, especially in rush hours, who would eventually need to be diverted to another service once the Humboldt branch met its maker. So, the north end of the outbound platform was extended and a new exit stairway was opened at the end, with a bus stop added at the bottom of same, to facilitate transfers to the North Avenue buses. At the same time, all maintenance and cleaning on the Humboldt Park branch was also suspended, causing immediate and obvious deterioration in the stations. The CTA decided that the Humboldt Park branch had no real future, and since they also now controlled the surface system they could substitute the service with more economical buses. Service on the Humboldt Park branch was discontinued on May 4, 1952. The Humboldt Park branch was abandoned as part of a larger effort on the part of the CTA rationalize the system and make it more economical by better coordinating the surface and rapid transit systems and shedding low-ridership routes. The decision to cease service on the branch was also as much a function of CTA needing to meet their fiduciary obligations to their bond-holders as it was to make the system more efficient. Alderman Geisler and local residents continued to fight for the branch even after it was closed. The day after service was discontinued, attorney Harry Booth filed suit in Circuit Court on behalf of Geisler and local resident Joshua Bernstein seeking temporary and permanent injunctions against CTA from taking further steps in the abandonment or in demolishing the structure. They also sought an injunction to compel the CTA to restore the service.4 The suit failed, however, when Circuit Judge Elmer J. Schnackenberg refused to issue the injunctions, stating that CTA was within its rights to eliminate the service, adding that the Authority can "do anything it pleases." Somewhat ominously, Schnackenberg added, "D-day for Chicago riders was June 4, 1945, when they voted approval of the CTA act. They set up a creature that was a power unto itself. The same power that created it can destroy it. "5 So ended the legal fight to save the Humboldt Park branch. Humboldt Park branch service was replaced by the new #72 North Avenue Limited, which ran from Winchester (a block east of the Damen station) to a loop at North/Grand/Kilbourn. The #72 North Limited bus operated during rush hour only and basically made the same stops that the Humboldt Park trains used to, but was extended further west to Kostner, thus tapping the commercial center at Pulaski and the industrial area west of Kostner. The North Limited bus went through various revisions through the years, including the movement of the west terminal, but was eventually discontinued on September 10, 1973. The section of the Humboldt Park branch west of Oakley was scrapped quickly. A contract for the removal of the Humboldt Park "L" structure was awarded to the Harvey Wrecking Company in late 1953. Approximately four months was estimated to remove the structure. The Harvey bid provided that the contractor would remove the entire structure from a point east of Western Avenue to the end of the line at Lawndale, and would pay the CTA $16,500 for the scrap generated. 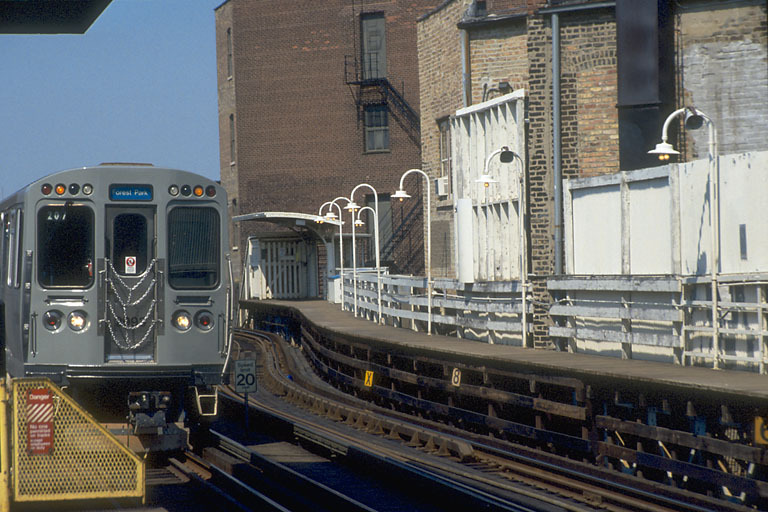 Rails and other operating facilities were not included in the contract -- they were removed by CTA forces, and stored for reuse at other locations on the rapid transit system. 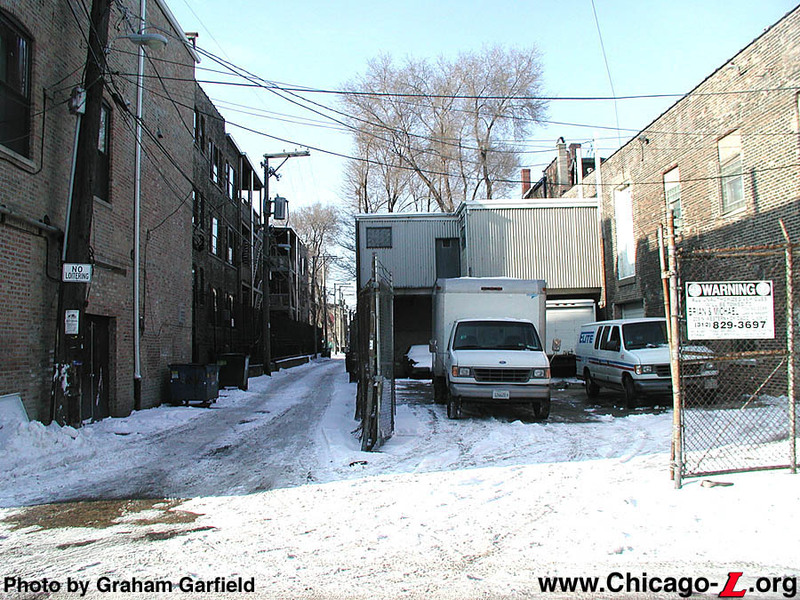 However, a three block stub between the Logan Square branch and Oakley Avenue remained for several years, along with the shuttle platform, although the connecting catwalk was removed. The stub was designated for "emergency car storage," though it was very rarely if ever used. More of the branch was removed in the mid-60s, leaving just a short, few hundred-foot long stub, which finally was demolished in the late 1960s. 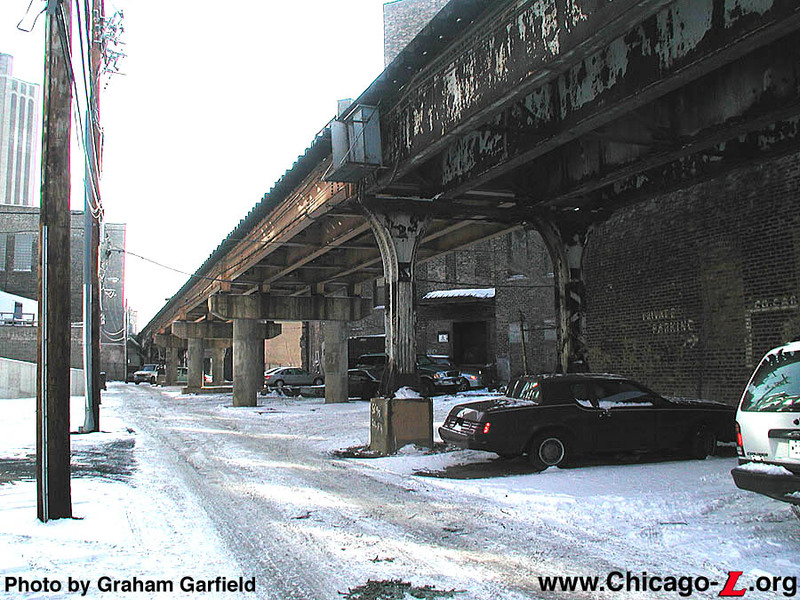 The last remnants of the branch junction could still be seen in the Blue Line's elevated structure north of North Avenue until 1996, when those spans were replaced. There is a myth that a station house, usually cited as Kedzie, is left on the Humboldt Park branch. This is untrue; unfortunately, all stations have been demolished. 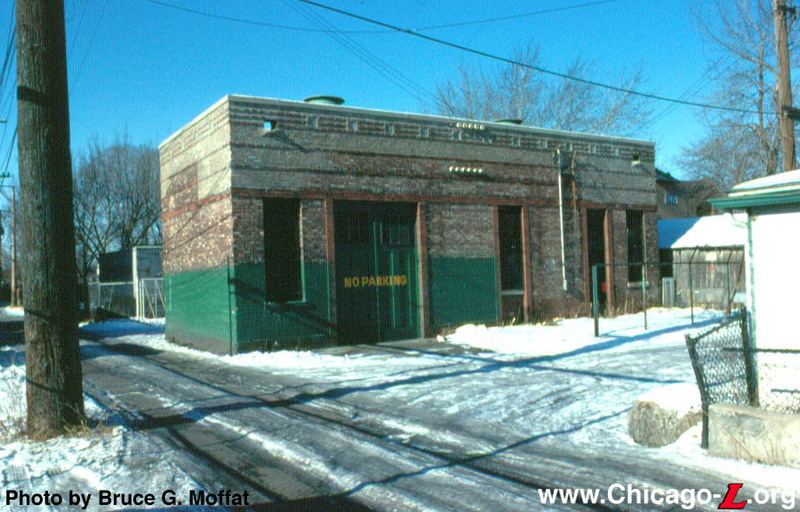 There is, however, a store across from the former location of the Kedzie station, probably built by the CRT in the 1920s, that is still in use. A steel support from the elevated structure is still embedded in the south elevation of the building, visible from the alley. Thanks to Art Peterson and Bruce Moffat for providing additional information and revisions. Some of the above information comes from Andris Kristopans. "CTA to operate Humboldt Park 'L' as shuttle." Chicago Daily Tribune. 1951 Feb. 2, page B9. "Aldermen vote to seek writ to halt 'L' cuts." Chicago Daily Tribune. 1952 Apr. 26, page 2. "City council halts move against CTA on Humboldt Park 'L'." Chicago Daily Tribune. 1952 Apr. 29, page 4. "Suit Demands Humboldt Park 'L' be restored." Chicago Daily Tribune. 1952 May 6, page 4. "'CTA able to do as it pleases,' court decides." Chicago Daily Tribune. 1952 May 16, page B12.